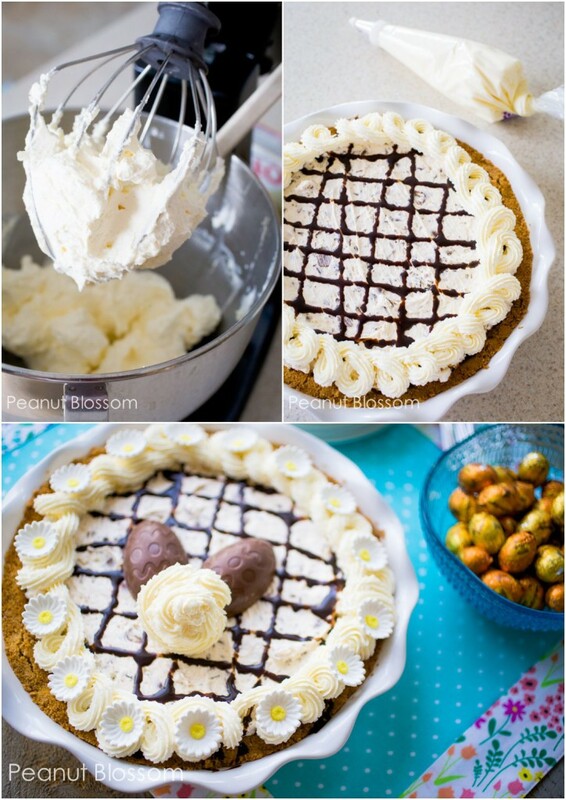 Butterfinger Pie: easy no bake cheesecake with a crunch! I love baking for Easter! 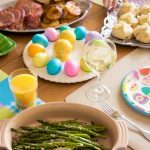 I find this holiday to be so much less pressure than the Christmas season and I enjoy making a frilly, fancy looking dessert for the Easter table. Normally, my go to choice would be a lemon meringue pie, but my kids will Not Touch it with a 10 foot pole. They can’t stand the tartness, all they want is Chocolate Chocolate Chocolate. I usually shy away from chocolate desserts for Easter since there is enough of that inside of their baskets, but I DO love whipped cream and cheesecake. 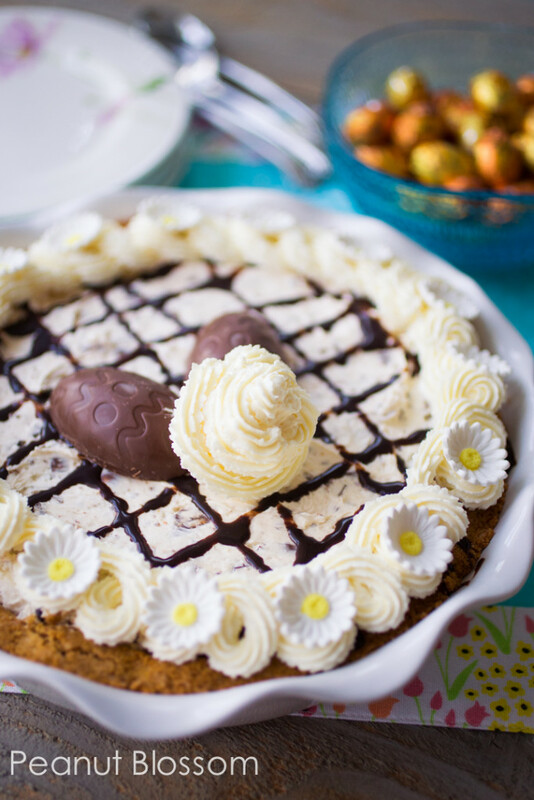 So this year I decided to compromise and pulled together a fantastic Butterfinger cream pie with Butterfinger’s new treats for Easter with no artificial flavors or colors. 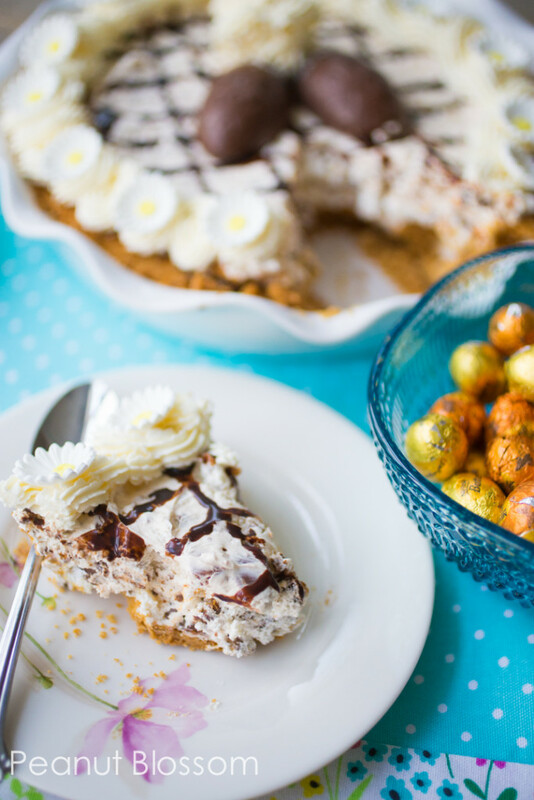 This pie is made with a simple graham cracker crust, an easy no bake cheesecake filling and oodles of chopped up Butterfinger NestEggs. 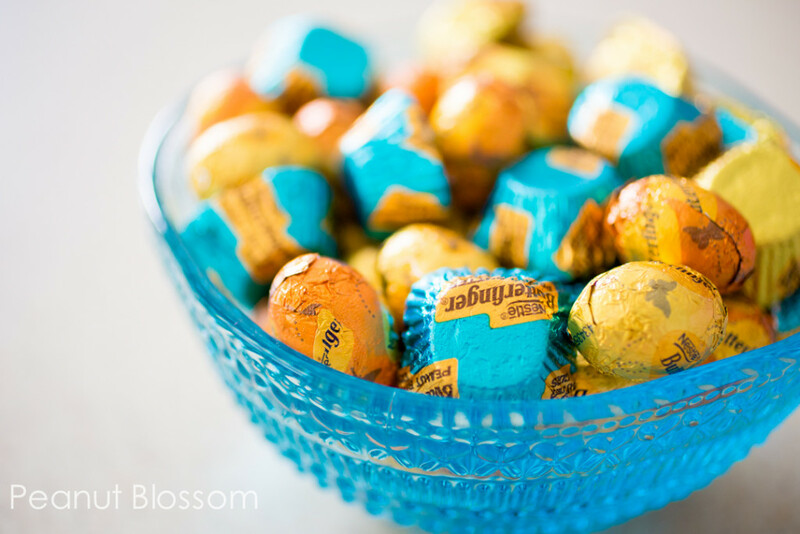 Butterfingers are a favorite in our house and this year Butterfinger has two new treats for Easter in addition to the classic NestEggs: the Butterfinger Peanut Butter Cups Minis and Butterfinger Peanut Butter Cups Smooth & Crunchy Egg. 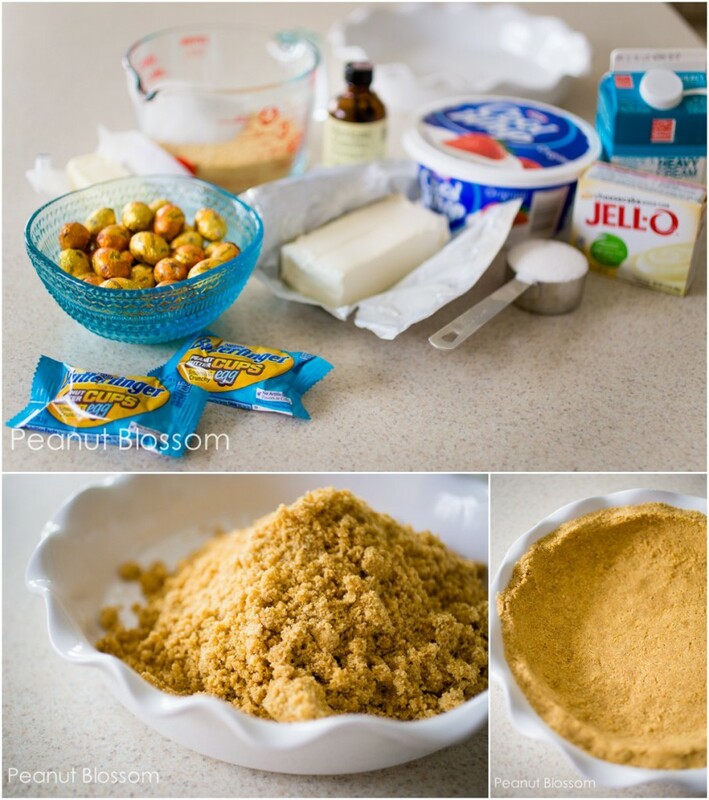 I mixed up a homemade graham cracker crust, but you could easily use a pre-made one from the grocery store too. To keep the dessert from being too rich, I let the Butterfinger candies bring the chocolate and peanut butter and kept the rest of the filling a light vanilla as contrast. I beat some softened cream cheese with a bit of sugar and then folded in a tub of whipped topping so the pie wouldn’t be too dense. I gently folded in the chopped candies and filled the pie. Since this belongs on our Easter table, I wanted to take the time to really decorate the top with something special. I decided to use 2 of the NEW Butterfinger Peanut Butter Cups Smooth & Crunchy Eggs on the top as a pair of “bunny feet” and wanted to use whipped cream to make a sweet puffy tail. Once I started to think about the whipped cream as decoration, I realized I needed something to help stabilize it for holding it’s shape. Did you know you can mix heavy whipping cream with half a box of instant pudding mix to make a thicker whipped cream that will hold it’s shape?! I didn’t either! But you totally can and it worked like a charm. I chose a cheesecake flavor pudding for it’s white color and complementary flavor for the rest of the pie. I squeezed a bottled chocolate sauce lattice top over the surface of the pie, spiraled the whipped cream around the edge, dolloped with some daisy candies I found at the grocery store, and added my Butterfinger bunny accent. But of course we totally did. And it was worth it. The filling is light and fluffy with nice solid chunks of crispety, crunchy Butterfinger bits throughout. The house was completely silent while my ladies tested it out, I’ve never seen them so absorbed in enjoying a treat before. If you’d like more Butterfinger baking inspiration, you definitely need to check out Butterfinger over on Pinterest. 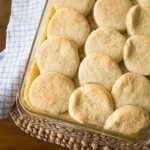 So many yummy looking recipes! 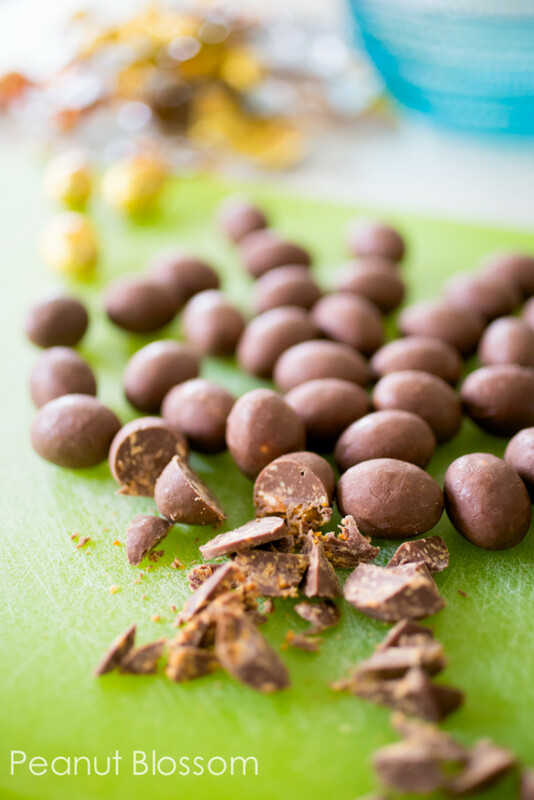 Roughly chop 1 package of Butterfinger NestEggs or New Butterfinger Peanut Butter Cups Minis *Contains no artificial colors and flavors. Added colors from natural sources. In a large bowl, use a hand mixer to beat the softened cream cheese and sugar until light and fluffy. Add the vanilla extract and beat to combine. 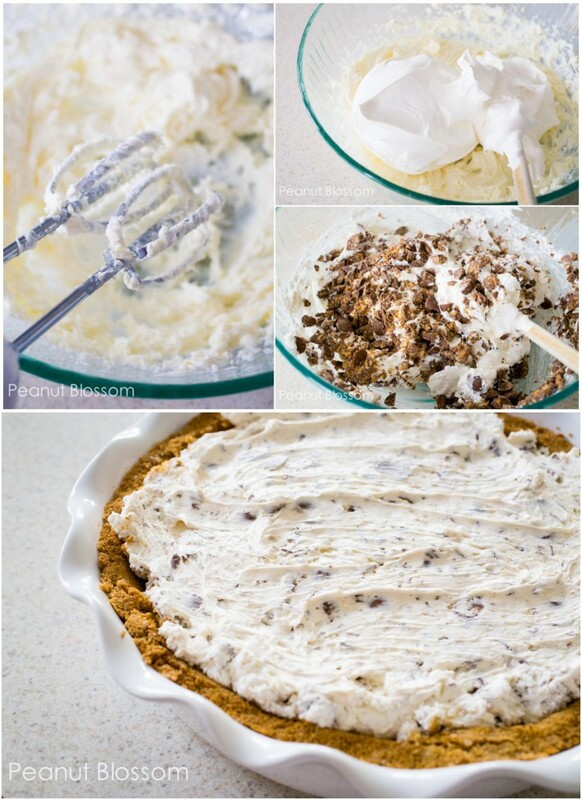 Scrape the beater and gently fold in the tub of whipped topping with a large spatula. Gently fold in the chopped Butterfinger candies. Spread the cream cheese filling evenly into the prepared pie crust. Pour the 2 cups of whipping cream into the bowl of a stand mixer. Using the whisk attachment, add the 1/2 box of pudding mix. Whisk on medium-high until stiff peaks form. Transfer the whipped cream into a pastry bag with large tip. Drizzle a chocolate lattice design over the top. Pipe the whipped cream in a pattern around the edge of the pie. Place 2 Butterfinger Peanut Butter Cups Smooth & Crunchy Eggs in the middle to be the “Bunny Feet” and pipe a bunny tail with whipped cream. Add candied flowers around the edge.